Areev was born out of a desire to create beautiful natural products that delight the senses and nurture the body. 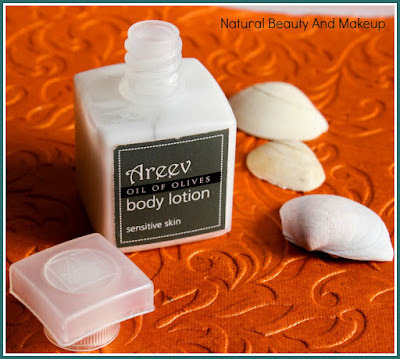 The name Areev stems from the Sanskrit words SundAREE and Vidhi meaning beauty and nature. *GROW SMALL, GROW RIGHT: Areev is a small scale manufacturing endeavour. We are committed to doing right by our people, our ethics and our raw materials. Specially formulated for sensitive skin, this moisturiser is rich in antioxidants that restore and repair tired skin. Easily absorbed, it leaves skin soft, with no oily residue. Claims: It hydrates plus clarifies the skin. Hand Processed with Natural Ingredients. Contains No Parabens, Sulphates or Phosphates. Our products are never tested on animals - only on willing human beings. Ingredients: Not mentioned on the packaging. But on Qtrove site, all the necessary details about the product are cited! 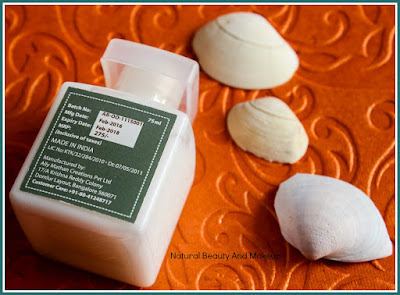 The 75ml body lotion comes in a small white coloured, opaque, square shaped bottle with an attractive lid. This packaging is convenient enough to carry around without worrying about its leakage. It’s a small, cute bottle which you can easily pop inside your office bag and use it whenever you want. Of course, travel-friendly! The lotion is pearly white with a semi-thick consistency. It has a distinctive fragrance, like woody musk scent. Does olive smell like that? No idea! I wonder, why this product named as Oil of Olives when there are no olives in the ingredient list😐 Quite misleading!! The main reason behind purchasing this product was the brand’s vision. Though, I didn’t do a lot of research before ordering it online (bad habit! as we must know at least what ingredients we are going to put on our skin) but later I found, it’s totally free of chemicals and is Vegan. Relief!! 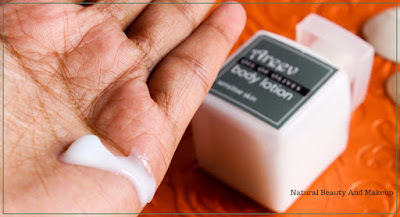 During the colder months, I first tried this lotion, hoping it would moisturize my dry body skin. Alas! It couldn’t satisfy my soul and skin!! My skin desperately needed some extra hydration which it couldn’t deliver. But, then what? I couldn’t throw that away because of this reason, so I saved it for the humid season to show its magic on my skin😉 As believed, it has been doing its job perfectly making my skin truly moisturized and hydrated. Though the texture is thick but gets absorbed within seconds leaving behind no greasy feeling. The formula is so lightweight that I do feel that it’s an absolutely wonderful product for oily and sensitive skin types that experience skin irritations during warm weather. The fragrance might be bothersome to the sensitive nose but the scent disappears soon after the application. The soothing moisturising formula keeps skin soft and hydrated for a long time; I don’t need to reapply it at night! But mind you, it’s not the same case with the extremely dry skin; reapplication is required multiple times for them. 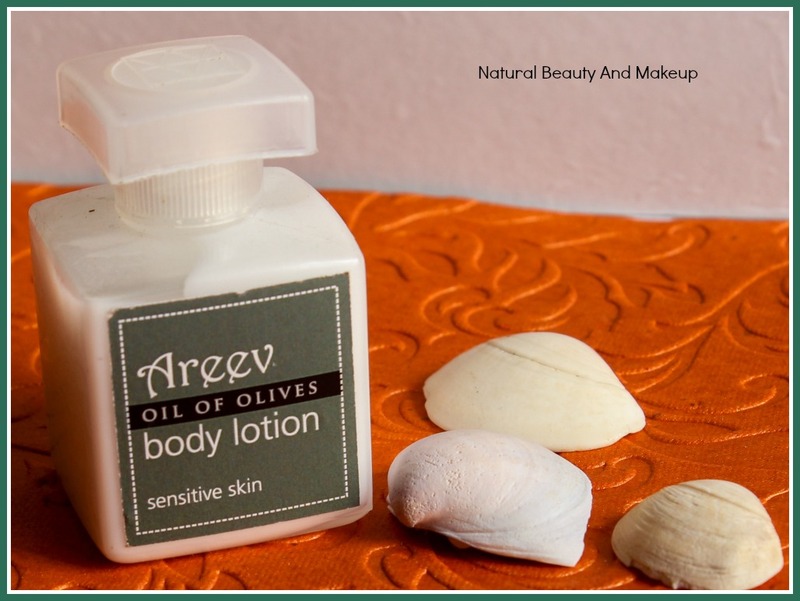 Areev Oil of Olives Body Lotion clearly mentions that it is meant for sensitive skin and it’s true to its claims. However, dry skin people cannot get much benefit from it as compared to normal & oily skin beauties. My body lotion is about to finish and I would love to repurchase it & use it during next summers. If you are looking for a lightweight, soothing body lotion for your sensitive and oily skin then this product is worth trying! Have You Ever Tried Areev Oil of Olives Body Lotion Yet? If Yes, Then Do Share Your Experience With Me In The Comment Section Below. Looks really good, I like the bottles!!! Absolutely <3 Thanks for stopping by! Price sometimes is not a matter for me, as long as its a lotion that fits into my skin. This one I think may not be it for my dry skin. But sure, I am all for cruelty free. Would love grabbing in discounts! I actually love the packaging a lot. It's simple yet so unique. Ingredients are also tempting as well. 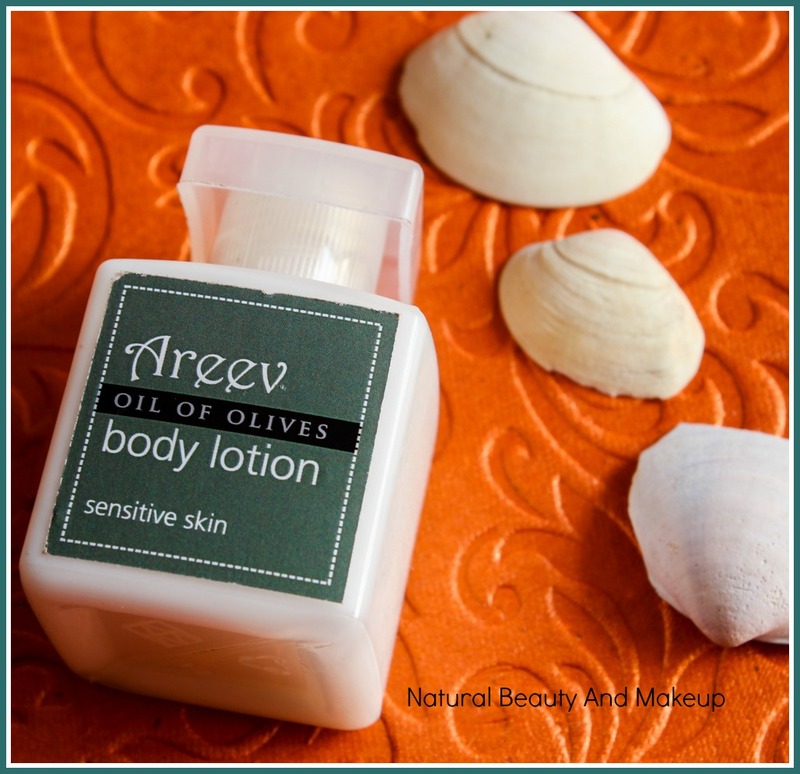 Looks like an apt body lotion for summer!